VIZ Media has announced that they have partnered with the entertainment division of National CineMedia to present Bleach the Movie: Memories of Nobody. The film (accompanied by exclusive interviews with the director, producer and character designer) be shown in more than 300 theatres across the country on June 11 and 12. According to VIZ's press release, "Bleach the Movie: Memories of Nobody begins as unidentified beings known as “Blanks” start popping up. They are soon followed by a Soul Reaper named Senna who makes them disappear. Puzzled by these unknown beings and the even more mysterious girl, Ichigo and Rukia set out to learn more, but uncover an evil plot when a menacing clan tries to kidnap Senna. Banished from the Soul Society long ago, the clan’s leader has sent sending the World of the Living and the Soul Society on a collision course, and Senna seems to be the key to his diabolical plot for revenge. 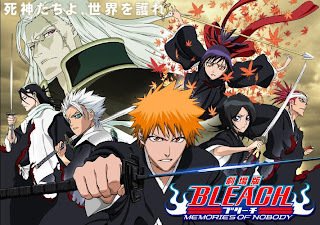 Can Ichigo and his fellow Soul Reapers save the two worlds from annihilation?" Bleach is one of those insanely famous anime series that I've never actually seen (it's in good company--I've never seen Naruto, Dragon Ball Z, or Gundam Wing, either), but I think I'm going to look up the series on Wikipedia and try to catch the movie. It's rare enough for any anime to turn up on the big screen... and there's got to be some reason Bleach has a bazillion fans, right?